The HNC’s 85th birthday party was a resounding success, as I’m sure all who attended would agree. Shrugging off an iffy forecast, approximately 100 people turned out on June 14 for a picnic at Princess Point. There, along the south shore of Cootes Paradise, a late afternoon breeze was already tempering the day’s mugginess, and sunshine prevailed … for a while. By the time the rains let loose, most of the scheduled festivities had wrapped up, with a couple of exceptions: plans for Bird Study Group members to lead birding hikes were washed out, the canoe excursions donated by Adventure Attic in Hamilton were put on hold, and prospects seemed uncertain at best. Even so, a core of intrepid souls refused to be put off by a little rain. Their patience and fortitude would eventually be rewarded. More on that later. The centrepiece of the evening was a new bronze plaque, awarded to the Club by the City of Hamilton in recognition of our 85 years of service to the community. The sign stands proudly at the head of the Hamilton Waterfront Trail, an asphalt pathway that leads to Bayfront Park. HNC president Brian Wylie applauded its accessible setting in a high traffic area. 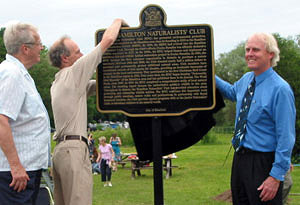 Moreover, as he pointed out, the location is historically significant, for, in its early years, the Hamilton Bird Protection Society, as the Club was then known, successfully lobbied to have Cootes Paradise declared a game preserve and bird sanctuary. The floral display of hosta, coleus and bleeding hearts that nestled at the base of the plaque were on generous loan from Jean and Jim Stollard. Also on the agenda was the planting of a young Tulip-tree, courtesy of the Junior Naturalists. As reward for their participation in Earth Day events, Sunoco had presented the Junior Nats with a $50 gift certificate, to be applied to purchase of a tree. The youngsters settled the sapling into its new home, a short distance behind the plaque, followed by a little fine-tuning from Warren Beacham. 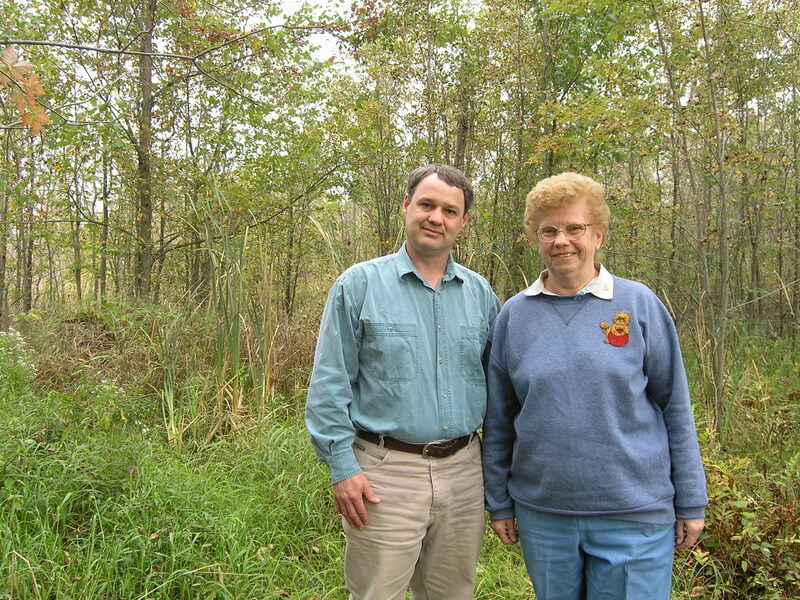 The Environmentalist of the Year award, bestowed to the HNC in 1988, was on exhibit, accompanied by several other awards the Club has earned over the years. These permanent tributes shared tent space with a birthday cake – an edible trophy just too good to last! Lettering proclaimed “85 th anniversary – protecting nature since 1919”, (in icing tinted naturalist green, of course). The cake also bore a fine reproduction of the Club’s logo. When the rain moved in, most folks moved out. An optimistic group, eager for a paddle in Paradise, elected to wait out the weather. About 17 hardy folks climbed into the two voyageur canoes under threatening skies and light rain. We battled the waves and a strong headwind for some time (anticipating a smooth ride back, which didn’t happen!). Gradually the rain eased off and we started to see Bank Swallows darting and wheeling over the lake catching tiny insects on the wing, then a Great Blue Heron, gulls, etc. Someone noticed a White-tailed Deer stepping daintily through the woods, and then several Black-crowned Night-Herons flew over, as we quietly paddled along, enjoying the peacefulness and the beautiful Yellow Flag ( Iris pseudacorus ) along the banks. We returned to the open water and continued westwards, with a glimpse of a sunset amongst the clouds, then across to the north shore to see the swans and lots of Great Blue Herons on a shallow gravel spit and swampy area. Then someone spotted another interesting bird on a small island nearby. As we approached it flew off…an Osprey! It was a steady paddle all the way back, as the wind had dropped and it was by now a very pleasant evening. However, just as the canoes were hauled back onto the trailer, it really started raining…what timing! What an appropriate and delightful finale! Next time stay and paddle with us! A very special thanks from the HNC to Glenn Barrett for his brilliant idea of the commemorative plaque and all his hard work in bringing the dream to reality, and our thanks to all the HNC members who helped with our 85th anniversary picnic event.